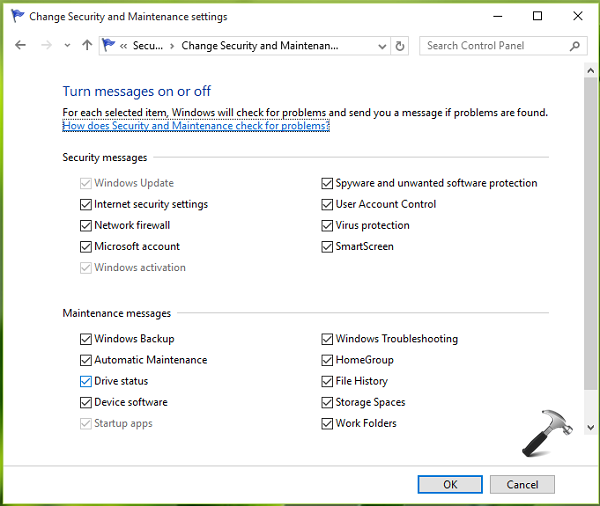 Learn how to enable or disable maintenance messages for Windows 10 so that you can get rid of irrelevant or interrupting notifications. While these maintenance messages are implemented for our comfort, however some users want to disable them. For those users, either these messages are interrupting type or irrelevant according to condition. One such unsatisfied user who want to disable these messages gives following reason for it – “I have a third-party backup software running on my system. Due to this I keep getting backup notification from maintenance section regarding this. Hence, its quite annoying for me and I want to disable these maintenance messages for a while”. 1. Open Control Panel from the Start Menu or using search. Click on System and Security link there. 3. Finally, you’ve arrived to Turn messages on or off section. Here you can individually turn of security and maintenance messages for specific feature. So if you’re getting with Windows Backup messages, simply uncheck the same option here and click OK. In this way, you can sort only those features, from whom you want to let notifications messages come. Once you’re done, close Control Panel and return to Desktop if you like. Related: How to enable/disable Automatic Maintenance in Windows 10. Do you know if there is an adminstrative way of doing this (i.e. regkey, GPO, script). We are currently building our enterprise image and would like these disabled on all machines. How to do it through group policy? I want to do it for more 20000 workstations. ^^ Try enabling this policy: User Configuration -> Administrative Templates -> Start Menu and Taskbar -> Remove the Action Center icon.